Carbon Black Metallic with Black Full Nappa Leather Interior. Factory Options Include:- SMG Drivelogic, Metallic Paint, Nappa Leather, Professional Navigation with TV Module, BMW Assist, Voice Control, Enhanced Bluetooth Functionality, Electric Folding Mirrors, Harmon Kardon Hi Fi System, Brushed Aluminium Shadow Interior Trim, High Gloss Shadowline Exterior Trim, Heated Front Seats, Windscreen with Green Shade Band, Front Centre Armrest, (2007 model year vehicle). The former car of the Hexagon Chairman, this vehicle has no-expenses-spared upgrades making it the nearest thing to an official BMW M3 CS Convertible. 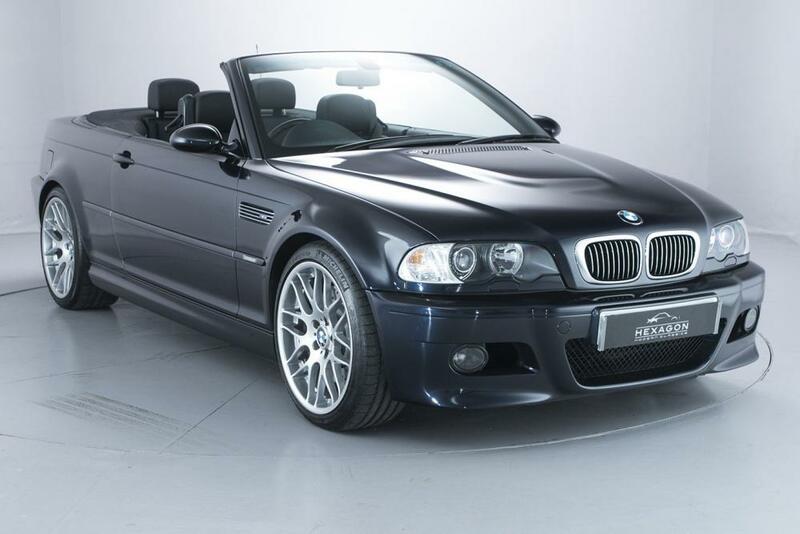 Possibly the best driving E46 M3 Convertible available, with some fantastic BMW driving upgrades that transform an already great car into something uniquely special. The BMW upgrades, include BMW CSL Running Gear, BMW Original CSL Alloys, BMW CSL Callipers & Braking System, BMW CSL Steering Rack.